-2ND LARGEST SHOPPING DESTINATION IN B.C. SWOT analysis against key competition. Clear description of the target customer by demographic, geographic and psychographic profile. Identify what marketing research and analysis will be completed as part of this strategizing. Complete a trade area analysis for your primary location and give your rationale for the selection of location. Identify key sales and service(s) policies. Complete a branding review of your business. Complete a summary 1-year marketing, advertising and communications plan and discuss how media choices support your strategy. Prepare a one-year budget for sales & merchandising, inventory and key expenses including overhead, wages and marketing. Complete the Specialty Leasing application form. Attach photographs of your merchandise and previous/current MRU/Kiosk setups. Include your business plan, marketing materials and website information if applicable. Email the complete application to the attention of Brooke Matilda at bmatilda@parkroyal.ca. New, innovative uses that enhance the existing Park Royal retailer mix. Successful experience in retail and a proven sales record. Unique and professional merchandising that showcases your product mix. 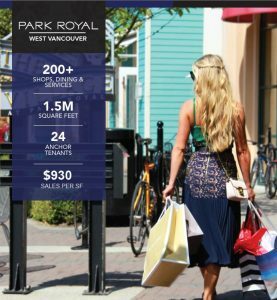 For more information and 2017 MRU & KIOSK Rates, please send a completed specialty leasing application form to: Brooke Matilda |bmatilda@parkroyal.ca. Click HERE For the full list of general guidelines for MRU & Kiosk at Park Royal.